The Freshwaters Illustrated Mission is to educate diverse public audiences about the life, study, and conservation of freshwater ecosystems through illustrative science-based efforts, and to provide illustrative resources and services to scientists, educators, and media specialists. The FI Vision is to help inspire a world that is more conscious of freshwater life and more sympathetic to the cause of freshwater conservation. Freshwaters Illustrated is a 501(c)3 nonprofit membership organization founded in 2003, the UN International Year of Freshwater. 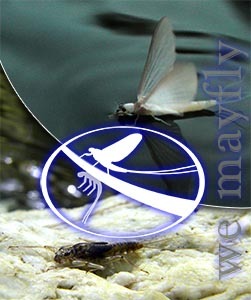 Mayflies are a diverse group of aquatic insects found in almost all freshwaters. Like most aquatic insects, mayflies "emerge" from the water as winged adults to swarm and mate, a life cycle that symbolizes our mission to share the hidden beauty that exists in fresh waters. 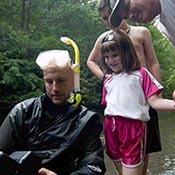 I see my job as helping to reconnect people to the vibrance, diversity, and profound importance of freshwater ecosystems. My background in aquatic ecology allows me to access stories and people that can help share and celebrate the beauty and value of freshwater life, and with a talented group of visual artists and communicators, I work to make those stories as compelling as they can be. Motivationally, my life is one shaped by water... touched by the beautiful life that swims in, crawls through, wades in, or skates on it … inspired by those who work to understand and protect its wonders. I founded Freshwaters Illustrated to help create and share imagery and stories that can demonstrate the diversity and shared values of the rivers, streams, lakes, and wetlands that run through our landscapes and our lives. I live with my wife and two daughters within canoe-carting distance to Oregon's Willamette River. 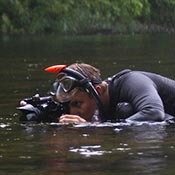 Dave is a strong visual force in our imagery, stories, and productions. His images combine his biological sensibility with a keenly artistic eye, and give intimate perspectives on the little-known aquatic and amphibious life of freshwaters, along with the people who study and conserve them. Dave has travelled the world to assist in and document biological research, and his stories have been published in widely read magazines, such as BBC World, National Parks. Dave has a degree in Wildlife & Fishery Biology from Colorado State University. Visit Dave's website.